Most single men don't pay much attention to which brand of laundry detergent they buy, beyond whatever's cheapest. But back in North Carolina, I had a friend who was adamant about using Tide and could identify others who used it by their scent. That's because Tide was the hood sponsor of Ricky Rudd, his favorite NASCAR driver, so for about 10 years that made this guy super fired up about whiter whites and mountain-fresh laundry. Rudd was a Tide racer; Leigh was a Tide guy. It works in the other direction too. As the driver of the No. 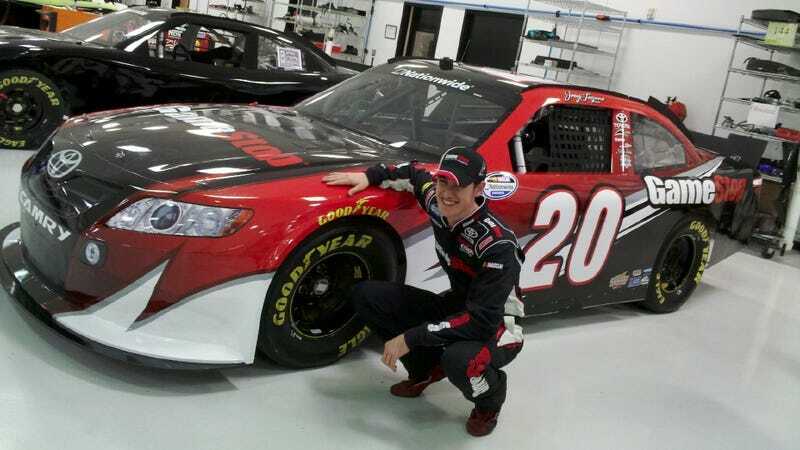 20 GameStop Toyota on NASCAR's Nationwide Series (one rung below the Sprint Cup), Joey Logano is the Gamers' Racer. GameStop's logo really is only part of the picture, as current games usually dominate the paint job (like LEGO Harry Potter does here). And When people who can appreciate games see BioShock 2 or Red Dead Redemption go zipping around a tri-oval, it sends a message that's as much an affirmation to them as it is an advertisement to others. "Yeah, I'm cool with the label," Logano, just 20, told me with a chuckle. He didn't mind, either, the semi-ironic fashion in which this site adopted him last year, tracking his finishes in 23 Nationwide races with GameStop as a hood sponsor - and another race on the Sprint Cup series, where Logano's regular ride is with Home Depot. NASCAR is well known for its driver accessibility and fan service, and they may get adopted by people they don't have much in common with by virtue of that sponsorship. That's not the case for Logano, though. Though a racing career going back to age 6 left little time for growing up at a console, controller in hand, he is a good representative for GameStop and video gaming - young, cheerful, and a rising star in a natural video game sport. "I was unproven at the time we got the GameStop sponsorship [in 2008], so they definitely took a gamble with me. Any sponsor you have, you're really excited, because if you don't have a sponsor, you don't race," Logano said. "But being a store where I used to go, and a store that can bring in a lot of fans, and we relate to them a lot, we were looking for something that would be a perfect match and we've got two sponsors that tie together very well." Logano doesn't just race with video games on his firesuit, he races in video games, too, particularly in NASCAR 2011 The Game, which released on Tuesday. And he plays racers nearly exclusively in his spare time, something I figured he wouldn't do - not because of any disparity in experience, but doing what is actually your job in your leisure time doesn't sound so entertaining to me. I don't play Mike Fahey Games Writer 2011 when I'm off the clock. "Yeah, but the thing about football players I always read is they're always playing Madden," Logano said. "If it's in your blood, it's what you do all the time. For us, we can't get a football and throw it in the backyard, and we can't get in a car and drive it 200 miles per hour out on the highway. So for us, it's always racing, always a racer game." Logano has a console setup within his team's RV - no ridiculously large television, because it is an RV, but both an Xbox 360 and PS3 in the back, and current drivers like Gran Turismo 5 and Split/Second (both hood sponsors last year), plus a copy of NASCAR 2011 The Game a few weeks before it released. For NASCAR 2011, or games that feature real world tracks where he races, there's a business purpose in it, too, Logano said. "When I first started racing [in 2008], I played a lot of NASCAR [then an EA Sports title] just to know what the tracks look like," Logano told me. "You go to so many every year, they all start to run together. So I'd sit there with a notebook and write down everything I'd done in the past year, just to refresh my memory, then go run a few laps on a video game to get the wheels turning, and get to the racetrack more prepared." And the gameplay of a strategic, realistic racer does have some practice value as well. "It's still racing, and a lot of things I do on racetrack as a driver - throttle here, brake here, a lot of that transfers over to video games," Logano said. "The G-forces and all the other little things that come into play when you get going, no, you can't replicate that. But the line you run, where you brake, where you gas, that part transfers." Logano's happy, of course, to sell video games to NASCAR fans, and he's happy to sell NASCAR to video game fans too. "You've really got to go to the race, hear the scanner, hear the driver and the crew chief and the spotter," Logano said, on scanners that are available for rent at the event. "When you're there you get the feeling of speed and horsepower, and what's going on behind the scenes. Once you get into that, it's a lot more than guys driving around in circles. It's like any other sport, you want to know what's going on and be educated." He's hoping that NASCAR 2011, which offers that kind of scanner audio and, of course, a directly personal experience in racing, recruits gamers to the track. With GameStop, he's already recruited plenty to his team. "It definitely brings me a lot of fans, and that is a big deal in NASCAR," said the Gamers' Racer. "More [fans] than I would have if I didn't have GameStop."